Fantastic shopping just off St. Patricks Street in Cork city centre. The most recent and modern addition to Cork’s retail quarter. 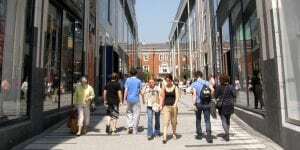 The pedestrianised Opera Lane provides a range of well-known fashion retail outlets including River Island, H&M, TopShop, GAP, Next, New Look, Office, Skechers and Tommy Hilfiger.